This book was written by fellow AAM members and edited by a former AAM member for the AICPA. The book can be read all the way through or by selecting the individual chapter that covers the issue you are dealing with. This book is full of how-to advice and examples that will help readers with ideas they can implement right away. 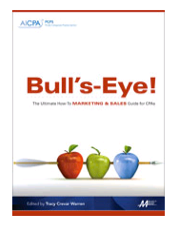 (Excerpt from the AICPA Website) "Bull’s-Eye is a collaboration of 37 of the industry’s most successful marketing and sales minds. Collectively these gifted professionals have served as pioneering practitioners inside the profession, and as outside advisors and thought leaders for hundreds, even thousands of CPAs and their firms. They give you an insider’s view of what it takes to build marketing initiatives that produce results."